Osian Pryce gave the VR4K Oreca FIA R4-spec car a dream world competition debut by scoring an incredible three fastest stage wins and finishing second overall on the Rallye Ciudad de Granada. 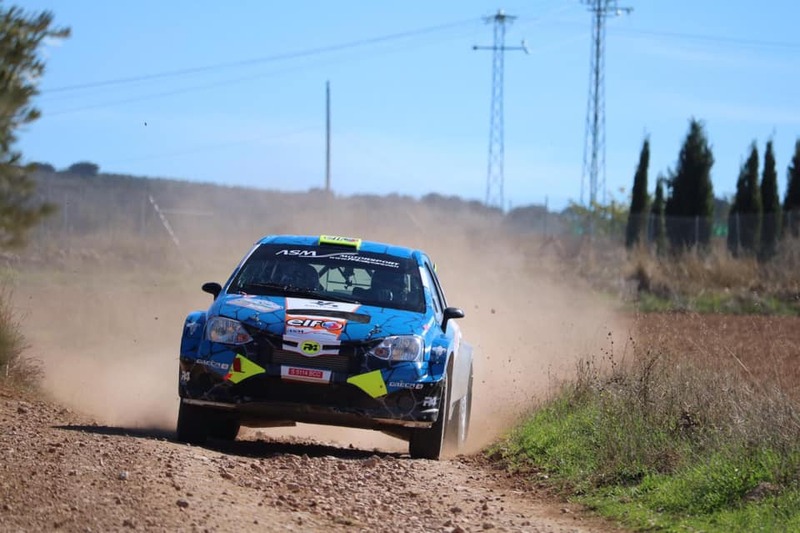 The Etios R4, which was prepared by Barcelona-based ASM Motorsport, via its dedicated R4 Rally Cars Division, ran faultlessly – beating more powerful and more expensive R5 and other four-wheel drive cars on the Spanish Gravel Rally Championship round. Pryce and co-driver Dale Furniss confirmed how driver friendly the R4-spec car is by being fast right from the word go – despite only doing three runs over the shakedown stage before the start of the rally. Yet the clever design and easy to drive nature of the R4 car made them feel right at home in it straight away. Having successfully completed Friday night’s short one kilometre asphalt stage around the streets of Granada, Saturday’s eight stages were all on gravel – with a further 93.44kms divided into three separate stages, two of which were ran three times and one tackled twice. The first gravel stage was damp, but despite taking a cautious approach Pryce was third quickest. Whilst two stages had very long straights, where outright power was a big advantage, the shorter of the three stages was a lot more twisty – and Pryce was able to illustrate the R4-spec car’s superb handling by scoring fastest time on all three runs through – SS4, 7 and 9. As the stages dried and the pace of the event increased, Pryce was able to hold onto second place, finishing just 52.5 seconds behind the Škoda Fabia R5 of Xevi Pons/Rodrigo Sanjuan. Osian Pryce said: “I really enjoyed driving the R4-spec car, and from a performance and results point of view I couldn’t have asked for any more. We only did three runs over the shakedown stage, but straight away the car felt good and easy to drive and we made no changes whatsoever before the start. We were a little cautious over the first gravel stage, it was damp and we knew we had a job to do, but we still set the third fastest time! It dried out after that, and some of the stages had very long straights where power was a big advantage, but where we lost out in outright speed – the R4 car had a near-standard engine – we gained in the tight and twisty sections. “One gravel stage in particular suited the R4 car, and we were able to set fastest time every time it was run, which we were very pleased with. The R4 car ran faultlessly, we set consistently good times and came away with second overall, which everyone was very pleased with. Álex Sabater, CEO of ASM Motorsport, said: “The purpose of coming to the Rallye Ciudad de Granada was to show that the FIA R4-spec car is a very competitive, reliable, strong and fast car – and this is exactly what we achieved. Osian did a very professional job, and gave Oreca and us a lot of very good technical feedback. With only three runs over the shakedown stage before the start, he was able to demonstrate what a good and driver friendly car the R4 is. To make three fastest stage wins, and finish second overall in a very strong field, on the R4 car’s world competition debut, is an incredible achievement. “Until today, a lot of people didn’t know what to expect from the new FIA R4-spec car. But we have shown that you can jump straight into it and do well right from the very first stage. Osian’s first comment was that the R4 was a very driver friendly car and easy to drive, which is one of the key design elements. Why spend a lot of money on a car that is difficult to drive, and expensive to run, when you can have an R4 car that is comfortable and easy to drive, yet still very fast and competitive? It’s the perfect car for a young driver wishing to progress from a two-wheel drive car and to show his talent and for a gentleman driver who wants to really enjoy four-wheel drive rallying, without making everything very expensive, stressful and complicated. It’s a fantastic concept, and we have shown to the world what R4 really is all about today.